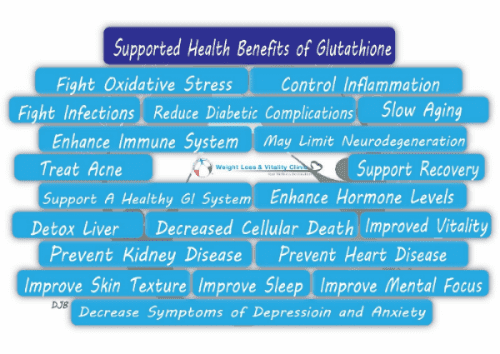 Glutathione is considered one of the most important antioxidants produced in the body. It prevents cellular damage caused by free radicals from normal body oxidation. Because glutathione has the ability to reduce free radicals it is associated with fighting most diseases, particularly the ones associated with aging. IV infusions of glutathione are preferred secondary to the improved absorption qualities. We offer glutathione infusion in varied doses from 2000 mg to 10,000 mg per IV. Also available at Weight Loss and Vitality are custom compounded glutathione suppositories which will provide similar results to the IV method achieving about 70% absorption rate compare to intravenous infusion. This method if optimal with patients would prefer daily glutathione supplementation.